We have just made it easy for everyone to get the tires they have always wanted here at Go Green Tires. Even folks with a lower credit score may still be able to get a nice set of tires with our no credit needed, 100-day same as cash financing. 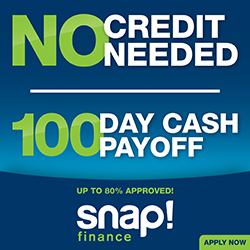 The financing is offered through Snap Financing. You’ll need a down payment of $10, a Valid State I.D., a checking account for at least 90 days, and a steady source of income for the last 6 months. The application is then processed by Snap Finance and if approved, you are eligible for financing of $250 – $2500! Our No Credit Needed Financing allows you to decide how quickly you would like to pay off your new tires. You’ll be offered 100-day same as cash financing but can also pay your new wheels and tires over 12 months if that works best for you.